Baseline out of bounds - Red. Play starts when the three slaps the ball. 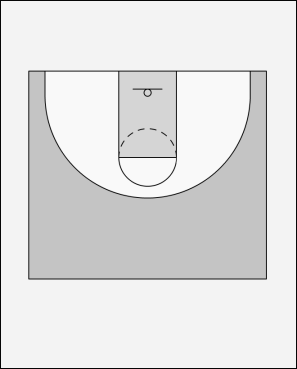 The four moves to the corner (block extended), the one to the wing & the two to the top of the key. The 5 starts a V cut away from the ball. 3 passes to 4 then prepares to screen for 4. 4 takes the screen from 3 and goes baseline. 5 finishes V cut back to the basket & three rolls off of the screen to corner. Things to look for: 1, 2, & 3 open for 3pt shot. Pass to 5 for layup.